This Equity Trust video discusses ways of going beyond traditional conservation easements to meet the new challenges posed by the growing market for rural estates. 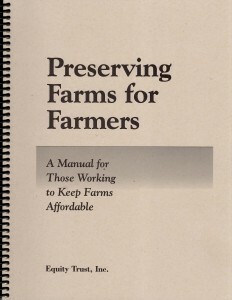 Preserving Farms for Farmers: A Manual for Those Working to Keep Farms Affordable, presents case studies of three individual projects that permanently protected the affordability and food-growing use of a farm, including the affordability and use of the farmhouse, barns, and other infrastructure. In addition, a fourth case study describes a state-wide whole farm preservation program in Vermont. These case studies provide a real world context for the farm protection model used by Equity Trust. In addition to the four case studies, this 136-page manual also provides model legal documents: a model easement with option to purchase, and a model agricultural ground lease. There is also extensive commentary on the technical considerations this model of farm protection entails. The manual is intended to be a guide for farmers, conservation land trusts, and lawyers involved in protecting the affordability and use of farms.